MASSIVE crowds flocked to cycling’s World Road Championships in Bergen in September where the huge attendances and support saw it favourably compared to when Norway hosted the Winter Olympics in Lillehammer in 1994. Best of the Irish over some demanding courses were Olympian Nicholas Roche and Mark Downey. Roche’s 12th in the 31km time trial was his best ever at World Championships (he was 13th in the same discipline in 2013). Downey, already a rising track cycling star, showed he’s also world class on the road by finishing ninth in the 191km U23 road race after being involved in a thrilling bunch sprint for the bronze medal. His ninth place equaled that of Philip Deignan in the RR at the 2005 Worlds in Madrid. Ryan Mullen won an U23 silver for Ireland at the 2014 Worlds, but in the time trial. Dan Martin’s 26th in the 180km elite men’s road race was the best of the rest and a considerable achievement given that the man, who was 13th in Rio 2016, suffered a broken back just two months earlier. Nico Roche got caught up in a pile up in the closing stages and finished 34th, while Ryan Mullen was 127th . Elsewhere fresh from becoming a two-time World Champion at the World Para-Cycling Championships in South Africa with her tandem partner Katie-George Dunlevy, Eve McCrystal returned a week later to become the top Irish finisher (5th) at Rás na mBan 2017, the premier women’s stage race in Ireland, which attracted a world-class field of 114 riders. DUBLINER Conor Stakelum (24) made sporting history at the Nebelhorn Trophy in Oberstdorf by becoming the first Irishman to qualify for ice skating’s senior European Championships. The event in Germany was the last qualifier for the 2018 Winter Olympics with six places for PyeongChang up for grabs, but the Stillorgan skater had another goal: to qualify for the European Figure Skating Championships in Moscow on January 15-21 2018. He had enough technical marks with his short programme last season to qualify but was 0.8 of a mark short on his long programme. He went to Germany needing 45 on the technical element of his long programme and clinched his spot at Euros by scoring 46.8. The four-time Irish champion, who hails from a famous Tipperary hurling family, learned his skills originally in the Dundalk Ice Dome (which closed in 2010) and in Belfast. He took a year out of college in 2014-15 to train in Dundee and, after completing a first-class honours degree in microbiology at UCD this summer, is now training full-time again in Scotland. KILDARE paddler Jenny Egan continues to make her mark internationally. She won her third medal of the season – a bronze – in the 26.2km K1 at the Canoe Marathon World Championships in South Africa in mid-September, where Ronan Foley was fifth in the junior men’s K1. Egan had already won gold and bronze in two World Cup events this year but, as with her latest success, they were in 5km races, which are also non-Olympic distances. Not long afterwards she returned home to fulfil a long time ambition; partnering her brother Peter for the first time in the legendary Liffey Descent, where they won K2 gold and were 10th overall. OLYMPIC silver medallist Annalise Murphy (27) has, literally, changed tack for 2018. The second generation Olympian, who was fourth in Laser Radial sailing in London 2012 and second in Rio 2016, still intends competing in Tokyo 2020, but has taken some time out from her Olympic discipline to take part in the 2017-2018 Volvo Ocean Race. She is crewing on ‘Turn the Tide on Plastics’, which is promoting inclusivity and sustainability, with an international youth crew that has a 50/50 male/female mix. The round-the-world race covers 45,000 nautical miles and features just seven boats. It starts in Alicante on October 22 and finishes in The Hague in eight months time. Murphy said the opportunity came at a perfect time in the Olympic cycle for her; “This is a great challenge for me. I’ll be learning about sailing 24/7 and it will make me a better sailor, not a worse one. It also means I’ll be refreshed coming back into the Laser with over two years to go to the next Olympics.” She also stressed that a really promising group of young sailors – Aoife Hopkins (Howth YC), Aisling Kelleher (Lough Derg YC) and Sally Bell (Royal North YC) – will be flying the laser radial flag for Ireland in her absence. Their progress at the European Radial Championships in October will be covered here next month. SEPTEMBER also ended on a high for Paul Dunne who got his long-awaited win on the European Tour on another great day for Irish golf. To clinch it with a birdie on the 17th and then chip in for another on 18th was a real ‘clutch’ win for the Greystones man who has not always finished tournaments as well as he has started them. His final round of 61 – including seven birdies and an eagle – will psychologically have removed that monkey off his back. Dunne famously led the British Open as an amateur, but his victory in Close House looked like the big breakthrough he has been chasing. His victory was particularly noteworthy given that he held off, by a three-shot margin, no less than Rory McIlroy, who himself shot five birdies in the last seven holes to finish runner-up. With Shane Lowry finishing seventh, the 2017 British Masters was a great tournament for Irish golfers who continue to rank among the world’s best. 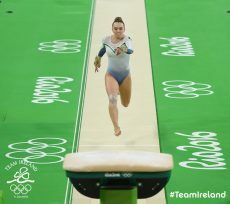 Ellis O’Reilly (19), who was Ireland’s first female gymnast to compete in the Olympics, has retired. The three-time Irish All Around champion made her international debut in the 2014 European Championships but has been involved in gymnastics since she was seven. She competed for Ireland at two World Championships (Nanning China 2014 and Glasgow 2015), two European Championships and at the inaugural European Games in Baku 2015 and was also a three-time silver medalist at the Northern European Championships. Competing in Rio 2016 was the pinnacle of her career and wrote her into Ireland’s Olympic history. She said: “I never thought I would even make it to a World Championship, let alone an Olympic Games but with the help and support around me it became a reality. I hope my achievements have inspired younger gymnasts that anything is possible, and therefore to always believe in themselves.” Ellis, who competed for Europa Gym Club in Crayford, Kent, completed her A-levels during the run-up to the Rio Olympics. She has since begun university, where she is studying to become a PE teacher.